Allows user to search across www.manupatra.com using google's chrome extension. 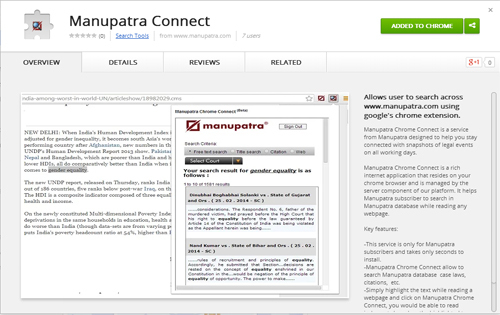 Manupatra Chrome Connect is a service from Manupatra designed to help you stay connected with snapshots of legal events on all working days. Manupatra Chrome Connect is a rich internet application that resides on your chrome browser and is managed by the server component of our platform. It helps Manupatra subscriber to search in Manupatra database while reading any webpage. - This service is only for Manupatra subscribers and takes only seconds to install. - Manupatra Chrome Connect allow to search Manupatra database case laws, citations, etc. - Simply highlight the text while reading a webpage and click on Manupatra Chrome Connect, you would be able to read judgments based on the highlighted terms from Manupatra. - It does not interfere with your work. Search results remains in your Browser.